I hope all enjoyed their long weekend, and I would like to welcome Carlos Quentin back to the fight. Nice to see him finally take an at-bat as a Padre during a regular-season game. I hope he plays every game from this point forward. If you have watched any of the Padres current 10-game road trip, you have been quite frustrated. San Diego has been swept out of St Louis, dropped 3 of 4 to New York, then lost a slug-fest yesterday. Although I found time to watch at least part of all 3 games in STL I haven't seen much of the 5 games since. I did manage to catch the top of the seventh yesterday, and saw one of those plays that I just don't get. The Contact Play. It should be called "The Contact Play That Never Works". Let's set the stage. San Diego trailed 8-7 after six. Chase Headley leads off the seventh inning with a hustle double to right. Jesus Guzman hits a fly ball to center, and Headley tags, making it to third standing up. Cubs Manager Dale Sveum makes the somewhat curious decision to play his infield in for Everth Cabrera. This is only curious because 15 runs have been scored, and 7 home runs hit, in the first six innings; it seemed likely the Cubs could score more runs over the next 3 innings. Anyway, with the count 3-1 Cabrera hits a sharp ground ball to third. Headley breaks for the plate as the ball is hit. It is fielded cleanly by Cub third baseman Ian Stewart, and he throws out Headley at the plate by 6 feet. The Padres ultimately don't score in the inning. Why in the world would Bud Black put the contact play on in that situation? The infield is IN, with limited ability to react to a sharply hit ground ball. Wouldn't it make more sense to wait the half-second and make sure the ball is through before moving towards the plate? Let's say Stewart gets a glove on the ball but can't field it cleanly, and the ball caroms away. With the rest of the infield in there's no possibility the shortstop (or anyone else for that matter) can recover to pick the ball up and retire Headley at the plate. If what usually happens happens, the batter is thrown out at first and the team still has a runner on at third with two out - and it's a lot easier to score from third on a single with two out than from first (I know - Master of the Obvious here). With the infield back, and a fast runner at third, I can maybe see putting the contact play on. First, the defensive team is conceding the run. Second, even if the infielder fields the ball and throws home, it takes longer for the ball to arrive at the infielder, and it is a longer throw to the plate. A speedy runner has a chance to beat the play (and depending on the runner, a GOOD chance). I know this falls under the 'As It So Often Happens' byline - you know, the line of reasoning that states whenever a player makes an outstanding defensive play to end one inning, he leads off the second? It doesn't happen all that often, but everyone notices when it does. For me, whenever the contact play is put on the runner is gunned down at the plate with Ivory precision (99 44/100% of the time). It's probably not that often - otherwise, managers would not continue to run the play - but it certainly seems that way. In this particular inning, it ended up being a moot point. Cabrera stole second on the very next pitch, and advanced to third when the 2-2 pitch to Andy Parrino got away from the Cubs catcher. So 5 pitches later the Padres were in the same situation they would have been if Headley had held the bag at third. And San Diego caught a bad break when the 3-2 pitch hit Parrino; if it had merely been in the dirt, it was such a bad pitch that Cabrera would have scored easily on the wild pitch. That sequence of events is the exception, the anomaly, the fortuitous turn of good luck vice the rule. Invariably when a runner gets thrown out at the plate on the contact play that is the end of the scoring chances for that inning. I'll add to my list of things trying to mine Baseball Reference or Retrosheet for incidences were, with the infield in, a runner got thrown out at the plate, just to see how often it does happen. There's no scoring category for THE CONTACT PLAY so the data will be somewhat inaccurate; but it will at least give us a glimpse into how often this kind of play is called, and what the success rate is. Some folks are vehemently against the Sacrifice Bunt. I am vehemently against the Contact Play. Teams who use the contact play are gift-wrapping an out for the other team. Seems really dumb. - The game actually entered the seventh inning in under 2 hours. I believe it was 2 hrs 5 min to the seventh inning stretch. Of course it took another 2:18 to play the rest of the game. Time slows down as the game gets longer. Starting 2B Howard Kendrick to LF. If it seems stuff like this happens more and more it's because it does. Back in the day when bullpens were 4 men deep, and starters on their throwing day would be long men out of the bullpen, managers had a lot more flexibility because they carried 16 position players on the roster. Now, with starters routinely not getting out of the seventh, and all the specialization out of the bullpen, pitching staffs have expanded. There have been a couple of teams this year (albeit it briefly) where they carried 13 pitchers and 12 position players. Baseball is great because there is no time limit. You can't run out the clock; you have to get 27 men out to win, or more if the game is tied after 9. Because of how the game is played today, and how rosters are managed to play today's game, teams are only built to play 9. If the game goes longer than, say, 11 innings, teams are forced to use the worst guys in the pen. The guys like Hisanori Takahashi with a 5.91 ERA, or Miles Mikolas with a 5.40 (numbers include yesterday's game). Look at yesterday. Bud Black used his best 3 bullpen arms for an inning each - in the seventh, eighth, and ninth innings. With the score tied and those guys out of the game you're just hoping you score before one of your less reliable arms gives up the go-ahead run. - Of course, this game wouldn't have gone 13 if anyone could drive in a runner in scoring position. Anaheim was 1-for-14 with RISP; San Diego 1-for-13. The winning run scored from first base thanks to Kendrick's bobble on Will Venable's single, which allowed Clayton Richard to scamper home. Kendrick was playing out of position, as noted above; although he did start 20 games in LF last year, yesterday was his first exposure there in 2012. - Additionally, starting with Chris Denorfia in the bottom of the seventh inning Saturday night, 9 consecutive pinch hitters in this series struck out. That streak includes both teams, and also includes Peter Bourjos' first AB after Vernon Wells left with a thumb injury. This particularly random streak of futility didn't end until Baker's double. - Will Venable was hit by Angels starter Ervin Santana in consecutive AB's. He is the first Padre to be hit-by-pitch twice in the same game since Everth Cabrera was plunked twice by Texas' Kevin Millwood in 2009. - Apparently HP umpire Doug Eddings doesn't like to ask for help. The first 3 check swings in this game were called strikes by Doug himself. On replay it looked like he got 2 of them wrong (Nick Hundley with the bases loaded in the first, and Venable with 2 out in the second). He finally asked for help when Andy Parrino checked his swing in the sixth inning. I'm not in a position to tell a seasoned umpire how to do his job, but one would think that the 1B or 3B umpire has a better view of a check-swing than the HP guy who's focused on whether the pitch is a ball or a strike. I don't think it a stretch to say the call on Hundley changed the game; he was hitting with the bases loaded in the first, and the Padres had been hitting the ball hard off Santana early in the game. We might not have played 13 innings had Hundley delivered there. Of course, the WHOLE game is different if the Padres tie it up or go ahead in the first inning, so saying the Padres win in regulation if Hundley has another pitch is a stretch - I know that. There is the possibility the game goes a lot differently if he gets another pitch. - This just in: Mike Trout is fast. He hit a slow roller to short leading off the 10th inning and beat the throw by a step. Usually that play is bang-bang. Trout hits right-handed. - This also just in: So is Alexi Amarista. He hit a line drive to LC in the bottom of the 10th and left the box thinking 2 bases. If Bourjos doesn't slide to cut the ball off, it's in the gap and Amarista circles the bases. Although Bourjos threw the ball to second, Amarista slid in without a play. Love love LOVE the energy he's brought to the Padres so far. - Amarista also hit a line drive to Angels SS Erick Aybar in the twelfth inning which Aybar then dropped, attempting to turn the 643 DP. Kerwin Danley, working 2B, said 'nay nay moosebreath' on that. Scioscia then tried to argue it. Uh, fellas - if I can't get away with that on my slow-pitch, beer league softball team, you can't do it in the majors. The fact the Angels tried was hilarious. The fact Danley vetoed it was just. - Is Pujols lost at the plate? Well, he had homered at Petco every year since 2008. He also homered here in 2006 and 2005. He didn't homer this weekend, and had only 2 singles in the series. He didn't hit a ball out of the infield yesterday. San Diego attacked him with fastballs and sliders. He looks lost to my untrained eye. Yesterday was a big win in the most-attended home series so far this year. San Diego flies to St Louis to take on the Cardinals, who are currently reeling, and were just swept by the Dodgers. The Padres might be more competitive in this series than many thought they would be just 2 short weeks ago. So I don't spend a lot of time on Baseball Prospectus (BP). However, I do follow Geoff Young (formerly of Ducksnorts) on Twitter, so when I saw some tweets to him about a BP event at the stadium I checked into it, and ended up signing up. Well, the event was tonight. And it was great. We formed up (sorry - Navy term. We stood around) at the Park Ave gate at 1645, and about 15 min later Joe Hamrahi arrived with the tickets. After everyone had checked in and gotten their seats, we entered the stadium and were escorted to a small conference room above the concourse down the third base line. There we had two question and answer periods. The first was with BP staffers and included Dave Pease, Corey Brock (Padres beat writer for MLB.com), Geoff, Sam Miller, Stephani Bee, and Jason Martinez. About 30 min in, Dan Evans entered the room; he had been held up in traffic trying to come down from LA. Too bad on Evans being late; he was a dynamic personality in the room and I for one would love to pick his brain. Oh, the questions. The first one asked about why the Padres didn't sign Adrian Gonzalez, which was hilarious because Padres COO Tom Garfinkel walked into the back of the room right as the guy started asking it. Garfinkel's smirk was awesome, kind of a 'still gotta answer that question, eh' look. Then the inevitable ownership inquiry. In fact, that the 'move the fences in' question DIDN'T get asked was the surprise of the evening. Joe H. jumped in with a minor league system comment, which led to a CBA question about how it will help the small market teams during the draft. Miller's comments on how he believed it would help the small market clubs in the long run was interesting; new perspectives are always good. Follow up to that was about high-end talent in the Padres system. I think it was Brock who made the point about how bare the Padre system was 4 years ago in a discussion about organizational depth. San Diego couldn't focus on the high risk, high gain players because the cupboard was completely bare. They had to completely restock the system; when there's no one there you can't afford to take a big risk and be wrong. Only now are the Padres in a position to start taking a chance on guys who could be gigantic stars but have some hurdles to over in the near term. A player development discussion followed, then a 'does Josh Hamilton resign with Texas' question, and will the DH be required in the NL (most agreed it would). Here Evans had some great points. He thinks it a disadvantage for AL teams to play in an NL park. First, they have to pull one of their main hitters out of the lineup. They are also scared to death one of their starters will get hurt running the bases; starters take up ~60% of the team payroll and are hard to replace. Just ask this year;s SD team. He thinks it an advantage for an NL team to play in an AL park, because it's so much easier to add a hitter to the lineup than to take one away. Most interesting to me, Evans believes NL managers are more push-button; that the game situation largely dictates when to take a pitcher out, double switch, and so on. AL managers manage more by feel, because the pitcher never comes up so theoretically you could leave him in the game forever. I should note that Evans grew up in the Chicago White Sox organization before becoming the GM of the Dodgers. That might play a role in his thinking; but there is some truth to what he said. Last question was on which fanbase should be more disappointed at this point in the season, SD or LAA? Consensus - LAA. Something about some guy named Pujols hitting less than .220.
what is being done so all fans can see the team locally. I finally had a question answered on MLB blackout rules - Major League Baseball doesn't drive them, the rules are written by WHO HOLDS THE TV RIGHTS. We can't get the Padres locally via MLB Extra Innings because the network with local broadcast rights doesn't want us to. It's the same nonsense as why one can't watch a ML game via Extra Innings on Saturdays between 1000 and 1700. Since all those questions were aimed at Garfinkel, he tried to bring Long back into the discussion. Long made two comments - that college player analysis is an untapped area, and that there is original research out there to be done (it all hasn't been covered) - figure it out and do it. That was it. Great night. We hung around in the conference room for another 10-15 min before they kicked us all out. The missus and I never made it to our seats, but that's a story for another time (get your mind out of the gutter - we were engaged in conversation). However, we were in the ballpark during the game on a night the Padres won, so that counts - my personal record now is 6-4 this season. Or, look at it this way - San Diego is 5-12 when I don't attend. I look forward to my season pass. It has been a long time since I watched an entire regular season series between two teams. Any two teams. Maybe it happened in 2001. But I got to observe both games this week between the Dodgers and Padres. Talk about two different games. Clayton Richard started Wednesday. That game kicked off at 3:35 which although not odd because the Padres play a lot of Wednesday afternoon games, it was odd because it was the first game back after a 5-game road trip. When was the last time a team played a day game following a cross-country flight? At least the Tuesday game had started at 10am our time. LA started 4 lefties against Richard, another oddity because Richard is left-handed. Typically teams don't stack their lineups with lefties when facing a lefty. Then again, the Dodgers started SIX lefties last night against Edinson Volquez, so maybe it's not that unusual for them. Wednesday's game did not start well. Eight pitches in the Dodgers led 2-0, the big blow being Elian Herrera's double, also his first major-league hit. Richard got out of it, and Chase Headley's HR in the home half brought San Diego back within one. It may have also relaxed Richard. After giving up 2 hits in 5 pitches, he allowed 2 hits over the next six innings. Clayton didn't walk anyone for the first time since his 8 April start against LA, and his 6 K's matched his second-highest total in a game this season. Game Score: 67, second best to that 8 April game (72). Richard apparently loves both pitching against the Dodgers at Petco and pitching during the day. On the other side, Dodger lefty Chris Capuano pitched pretty well himself. He allowed only one other hit besides the Headley HR, a hustle double by James Darnell. Darnell plays every game like it's his last. His aggressive approach paid off on this play; it wouldn't last night, as he sublexed his left shoulder trying to make a diving catch on Tony Gwynn Jr's line drive in the sixth. If Capuano could have solved Headley he might have won this game. Chase followed his HR with a 10-pitch walk leading off the fourth. Headley came up with 2 on and 1 out in the sixth, saw seven more pitches, then lined a 2-run double up the gap in left-center to give the Padres the lead. Here's a cool statistic: At this point in the game Capuano had thrown 78 pitches, and Headley had seen 21 of them. Twenty-seven percent of Capuano's pitches had been thrown to Headley. Ridiculous. Richard kept cruising. He gave up a 1-out double to Jerry Sands in the fourth, then retired the last 11 hitters he faced. Andrew Cashner came on and blew away the side in the eighth. Although Bobby Abreu broke the consecutive retired string at 15 with a 1-out single off Dale Thayer, Darnell made a spectacular diving catch to rob Andre Ethier, and James Loney fouled out to Headley to give the Padres a 4-2 win. The only other weird things in this game were the two throwing errors by pitchers, one by each team. If one can throw the ball to the plate with precision at 90MPH, they should be able to toss it to first. Not so much. There'd be another pitcher throwing error in last night's game. Between the games the Padres made a number of roster moves. Jason Bartlett was placed on the 15-day DL with a knee issue. Eric Stults was claimed off waivers from the Chicago White Sox. The Padres called up Everth Cabrera (his first return to the majors since July 2011) and Alexi Amarista (acquired in the Ernesto Frieri deal). Both those players started last night. By far, the biggest news was Orlando Hudson's unconditional release. Initially I thought this was just a fancy way of saying 'Designated for Assignment', but that's not true. If a player is DFA'd, the club places him on waivers for 10 days, during which time any other club can claim him; then the two clubs have ~10 days to work out a deal. If the player clears waivers, he can be sent to the minors or given his release. When the guy is given his unconditional release, he just leaves. That's it - see ya. I was a little bit surprised by that. O-Dog still has some value at the major league level. Yes he's 34, and he's hitting .211, but he's still a veteran guy who was a 2-time All-Star and a 4-time Gold Glove winner. Some team out there will give him another chance (hello, San Francisco? ), wouldn't they? Couldn't a trade have been worked out once he was on the waiver wire? Is the team better without him? Well they can't be much worse. Hudson struggled this year, and he struggled last year, at the plate. His defense is what it is, and this year by UZR/150 (-3.3) it's as mediocre as it was last year (-3.5), granted in about 1/4 the innings. I guess from that perspective why not let the kids play. It's also worth noting Hudson isn't the sole reason San Diego has started 13-24. Carlos Quentin hasn't yet taken the field for a Major League game in 2012. Cory Luebke may need season ending surgery. There are 10 other Padres who have done time on the DL (not including Darnell, who may go there today). In some ways, though, Hudson and Bartlett became the most visible examples of what this team is lacking - sometimes sloppy defense and a lot of futility at the plate. One wonders how much time Bartlett has left on the roster. - Volquez got squeezed right out of the gate. His first pitch to Dee Gordon may have been a strike, but his second one was definitely a strike. Nope, both called balls. Volquez struggled to get ahead of hitters the rest of the game. - Was it my imagination or was Volquez throwing a lot of off-speed stuff early in the count? Seems his previous starts he's featured his 94-95 MPH fastball and worked off that. Last night he seemed to reverse that pattern. I thought initially he might be injured, but there was nothing wrong with his velocity so it must have been the game plan they tried to execute. Ted Barrett having a phone book for a strike zone didn't help. - Bobby Abreu takes FOR-EVER to get into the box. Then, he steps out after every pitch to collect himself. No wonder games at the ML level last around 3 hours. - Abreu's triple in the first was smoked. I thought Cameron Maybin took a good angle to the ball, it was just hit so hard it skipped past him. Stuff happens. - It took 16 pitches last night for the Padres to fall behind 2-0. I guess that's an improvement over Wednesday. - As good as Richard was on Wednesday, that's how good Aaron Harang was last night. He scattered 4 hits, two of those doubles off John Baker's bat. Harang also struck out 6 and didn't walk anyone. True to form, he allowed a lot of fly balls; San Diego hit 10 balls in the air (9 outs), but it didn't matter. - Amarista made a very heads-up play to end the second inning. Mark Ellis' ground ball up the middle was hit such that Amarista had no play at first; so instead, and knowing that Gwynn Jr is aggressive, he threw behind the runner to third. Result - 4-5-2-5-3-4 putout that ended the inning. Nicely done. - Maybin should have Ethier's fly ball in the fifth. There's no other way to say it. I bet if you asked him, he'd say he should catch that ball 100 times out of 100. Yes, it was hit hard; but Maybin was there. - Darnell sold out trying to catch the Gwynn line drive. Unfortunately he was already moving downward when the ball glanced off his glove and he didn't have time to brace himself. I love the way this kid plays, but the risk of injury is always great with that style. Hopefully his DL stint isn't too long. - Is it me or does Andy Parrino strike out a lot? Eighteen K's in 77 PA (24%) seems like a lot. - Alex Hinshaw had a bad-luck seventh. Cabrera couldn't corral Ethier's hard ground ball up the middle. Adam Kennedy rolled the ball down the third-base line, which was perfect since Headley was swung over into the hole. Harang hit a soft ground ball about 25 feet into no-man's land that went for a hit. Only Loney's single to right was well struck. Hinshaw ended up giving up 2 runs in the frame. Sometimes it's not your night. - Memo to Mr. Amarista: For the Love of God, PLEASE pick a different walk-up tune. I'd rather hear fingernails on a chalkboard or someone dragging a cat across a washboard than be subjected to Jorge Cantu's theme music again on a recurring basis. - Surprised Scott Van Slyke uses batting gloves. His dad never did. - Harang managed to strike out on a foul bunt twice in last night's game. Baseball Reference doesn't let one search for foul bunt strike three's, or if they do I'm not smart enough to figure out how to write the search. I can't imagine there's been a lot of players who've struck out twice in the same game on a foul bunt. Maybe that minutae is only interesting to me. Interleague starts tonight with the Angels from the Greater Los Angeles Basin. Signs indicate Albert Pujols is heating up, just in time for the Padres. Oh goody. Congratuations to Stephen and Robert, who won the World Series Game 6 DVDs. Here's where I say 'the check's in the mail', however the check is not in the mail yet because I haven't made it to the post office. Yet. They should go out tomorrow. Next, I'm 5-3 now at Petco after watching yesterday's 4-2 win over the Dodgers. I'm going again tonight, so I'll combine my random thoughts into one mega-post. Early tease - James Darnell plays the game the way I like to think I play it. OK, onto today's contest offer. In tandem with a couple of fellow BBA websites, I-70 Baseball, Pitchers Hit Eighth, and C70 at the Bat, and on behalf of the Sports Vacation Guys, two of you have a chance to see the Padres in St Louis Monday night. Yes that's this Monday, the 21st of May. If Fortune has favored you (or Fate has sentenced you) to a trip into the Greater St Louis area next week get there on Sunday, do your business, and watch the Padres play the World Champs Monday night. 1. If you could go see the Padres play a road game in any other MLB team park, which one would it be? 2. Who would you take with you? Two ways to enter. You can post your reasons in the comment section of this here site, OR you can email it directly to Contest@SportsVacationGuys.com, which is probably a better call since you have to provide your name and address with your entry. And it would also mean you're covered in case I get hit by a bus or something. Now I must say THIS OFFER DOES NOT INCLUDE air fare, accomodations, rental cars, or anything else you might need to get from here to there. You're on your own. I'm cool, and so are the SVG folks, but we're not that cool. Or independently wealthy. As you probably know, Neo-Busch is typically engulfed with folks sporting cardinal red during a game. A little Brown and Gold in the crowd would clash deliciously with all that monochrome. You want to talk 'Best Fans in Baseball'? How about a couple of kids from the Coast adorned in colors their team hasn't used as its primary scheme for 30 years! THAT'S FANDOM PEOPLE! So get your entries in, and Good Luck! Winners to be announced Saturday afternoon at this site. - Loved Cameron Maybin's hustle on his first-inning double. Think he might have seen Harper double just past shortstop in Sunday's game against the Phillies? Also was it just me or did Maybin need about 4 strides to make it from first to second? Speed never goes into a slump. - I think people were seeing the ball well out of Drew Pomeranz's hand. Yonder Alonso's single to score Maybin was smoked, and almost took the young Rockie hurler with it into CF. Edinson Volquez's drive found Pomeranz, although Drew recovered to throw Volquez out. That line drive would eventually force Pomeranz from the game with a right leg quad contusion, but not before he clobbered a 3-1 Volquez fastball off the facade in LF. That was a shot, people. - Friday's theme of weirdness continued. We saw another wild pitch, another passed ball, another runner caught stealing, and the weirdest play of all, Rockies catcher Rosario out trying to advance on a ball just barely away from Nick Hundley. Rosario was out by 3 feet. And BZ to Orlando Hudson for keeping the tag on Cuddyer and throwing Cuddyer out when his momentum carried him past the bag. - Chase Headley's slide to score the Padres third run was exemplary. He's safe IMHO even if Rosario holds onto the ball. - Nothing kills a rally like Hudson and Jason Bartlett striding to the plate. They were a combined 0-4 with runners on, and stranded 5 in scoring position between them. San Diego should have blown this game open in the third inning. - I'll be the baseball is a big as a beach ball to Alonso right now. Everything he hits is a rope. One will never prove it but it sure looked like Colorado pitched around him in the fifth inning, even though Jesus Guzman was on first base. - Headley's caught stealing earlier in the fifth looked like a busted hit and run, busted because Guzman didn't make contact. - Gotta love the Padres bullpen, the lone bright spot on this team. They threw 3 2/3 no hit ball, striking out 6, to preserve Volquez's first win with the club. Jeff Suppan goes tomorrow, his opponent is still TBD (at least as of 5pm Monday). I won't be back in the ballpark until sometime next week, but the Padres don't need me to win - do they? Last night's 9-8, 12-inning loss to the Miami Marlins has to be the wackiest one I've seen in person. Unlike the mainstream media, Gaslamp Ball, and some others I was not up to writing about it at 1am this morning. This is what happens when your day starts 21 hours earlier. Wild Pitches. There were 4 in the game. The wackiest had to be the wild pitch on a pitchout in the third inning by Anthony Bass, which allowed Emilio Bonifacio to reach second. I can't recall the last time I saw that happen, or if I've ever seen it at the ML level. Marlins reliever Randy Choate threw two during Chris Denorfia's AB in the seventh that pushed Andy Parrino to get all the way to third. Balk. Jose Reyes baited Bass into a balk that allowed him to score from third and tied the game in the sixth. Baserunning Hijinx. Three stolen bases (two by the Padres), two additional bases taken by San Diego thanks to defensive indifference, a runner picked off first by the catcher (Bonifacio, by Nick Hundley in the eleventh thanks to a timely pitchout call by Bud Black), and a runner cut down trying to advance (Yonder Alonso, by Giancarlo Stanton in the seventh). By the way, Marlin reliever Dan Jennings grounded to short in his first ML at-bat in the fourth, and fellow Marlin reliever Chad Gaudin struck out for the first time this season (he had 2 previous at-bats). And all that's before we get to the Marlins' staking Josh Johnson to a 5-run lead before the Padres batted, then Johnson's inability to get out of the third with the lead, Bass' huge night at the plate, Heath Bell's bad luck in the ninth, or the fact that the game ended 10 minutes before midnight. I kept waiting for bees, rain, and Godzilla to move through the Park at the Park. Why not? The whole game seemed surreal. If you were one of the 29,201 who went yesterday you got your money's worth. - Last night Bass became the 19th Padre pitcher ever to triple, and the first since Jake Peavy did it on April 19, 2007. He also became the 14th Padre pitcher to drive in at least 3 runs in a game. FWIW, the team record for most runs driven in by a pitcher is 4, shared by Mike Corkins (9/4/70), Tim Lollar (5/15/84), Eric Show (9/27/85), Mark Thurmond (6/8/86), and Peavy (7/26/06). Two more thoughts on this: (a) Bass' ball got past Stanton and rolled all the way to the wall. He had a shot at an inside-the-park HR, but honored Glenn Hoffman's instruction to hold at third base. If it was you, would you have run through that stop sign? I think I would have. How many pitchers have hit an inside-the-park HR in their career since WWII? (b) Tim Lollar hit 3 triples as a Padre and drove in at least 3 in a game runs four times. I'd forgotten how good a hitting pitcher he was. - Having Alonso tag on a fly ball to Stanton was ridiculous. The slowest guy on the Padres against one of the best arms in the NL. The ball beat Alonso to the bag on the fly. - I thought Venable's attempt to throw out Bonifacio in the seventh was ill-advised. Bonifacio was already around third when Venable picked up the ball, and Will was playing deep against Greg Dobbs; not to mention there were 2 out and Bonifacio was off at the crack of the bat. He had no play. The throw allowed Dobbs to take second, and subsequently score on Omar Infante's single to left. - A lot of folks commented about it on Twitter during the game, and I agree: booing Bell when he came in was crap. Total and complete crap. The guy bled Padres brown for 4 years, wanted to stay here, and only left because the team wouldn't pay him. Boo guys like Albert Pujols who get competitive offers from their former teams and leave anyway for slightly more money; don't boo guys like Bell. Yes, Bell blew the save, but it's not like he got tattooed during the ninth. Jesus Guzman had swung through one, and fouled off another, 93+ MPH fastball before hitting a ball just fair down the RF line. And just fair by, like, 2 feet. Cameron Maybin's double came on a check-swing and would have been a ground out to first had the infield been playing back. I'd call that some bad luck. Bell's closer position is in jeopardy. - Dobbs takes for-EVER to get into the box. That is all. - Everyone was ready to start the top of the 11th except for Alonso, who was nowhere to be seen. He emerged about a minute later. There's no witty comment here, I just thought it was funny. So not only do the Padres use everyone in their bullpen (Miami used everyone but Home Run Ed) and lose in 12, but before the game we heard Cory Luebke likely needs season-ending Tommy John surgery, and during the game Huston Street left with a right posterior shoulder strain that was changed to a lat strain after the game. If Street he headed to the DL - and it's probable he is - I would expect Andrew Cashner to fleet up to the closer's spot. The hits just keep on coming for the Padres this year. This is a quick follow-up to a post I wrote two weeks ago about MLB's latest Baseball Greatest Games release. 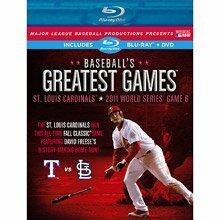 I've been provided two additional copies of the 2011 World Series Game 6 BluRay/DVD combo set that I'd like to give away. Of course, this being a Padres blog and that game not involving the club makes devising a giveaway appealing to my readers a little problem-matic. I expect it will generate some interest amongst Cardinals fans, however. To my count there have been 4 major trades between the Padres and Cardinals in the last 30 years. One involved someone currently on the Padres roster. I will send one copy of this game to the first two people who can name the player, and list the other player(s) involved in that trade. Send your guesses to padrestrail@gmail.com. Please note that if you've already won this disk from another website you will be ineligible to receive one of these two. Disk provided courtesy A&E Networks Home Entertainment/MLB Productions.